Fr. Quinn with the orphan children at Wading River L.I. Most Reverend Charles Edward McDonnell, with his idea of starting an “apostolate to Blacks”. The Bishop refused his request; at the time, the United States was engaged in the First World War and the Bishop’s primary objective was to identify priests willing to serve as Chaplains in the Army. Father Quinn immediately volunteered and landed in France, shortly after his arrival the war concluded but Father Quinn stayed on to minister to the wounded. Upon his return from France, Fr. Quinn was granted permission to begin his apostolate to black Catholics. In 1922, Fr. Bernard Quinn bought what was formerly a protestant church; the building was blessed and dedicated to St. Peter Claver on February 26, 1922. The zealous priest would later go on to found Little Flower Children Services, to care for the increasing number of black children orphaned as a result of the Great Depression. Situated in Wading River, Long Island, Fr. Quinn and his collaborators heroically opposed the Ku Klux Klan who in two separate attacks had burned the orphanage to the ground. 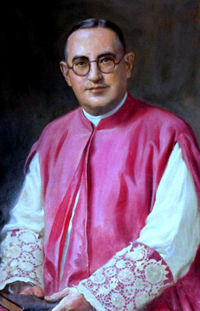 Monsignor Bernard Quinn died on April 7, 1940 at the age of 52. He was buried from St. Peter Claver Church, where eight thousand people attended his funeral. On Thursday, June 24, 2010 at a 7 PM Vespers Service at the Church of St. Peter Claver, Brooklyn Bishop Nicholas DiMarzio officially opened the Canonical inquiry into the Cause of Canonization of Msgr. Bernard J. Quinn. “As I was recovering from heart surgery last year” said Bishop Nicholas DiMarzio, “Father Quinn seemed particularly present to me in prayer. I drew strength from his courage and resolved to redouble my efforts to participate in promoting his cause as a sign of the need for holy priests."